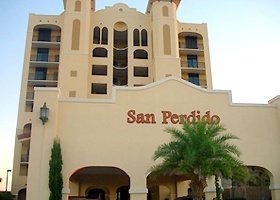 San Perdido Condos are located in a low density luxury development in Perdido Key, Florida. Built in 2002, this well-appointed condo complex is rent-restricted, which means that owners are afforded a residential, intimate setting to enjoy the approximately one-hundred and fifty foot stretch of quiet Gulf coastline. With only twenty-three units total, three on each floor except for two penthouses on the top floor, you can imagine the privacy the lucky San Perdido condo owner will enjoy living there. San Perdido condos are a special jewel of Perdido Key, and property listings often do not last long when they become available to the market, for good reason! Continue learning about what makes San Perdido a premier development here. All San Perdido condominiums are accessible by security coded elevator. Plentiful amenities such as a sun deck, indoor and outdoor heated pools, sparkling wading pool, hot tub, sauna, fitness and steam rooms, and large gathering room leave no beachside leisure activity unsatisfied. The spacious San Perdido condominiums are all four bedroom, four and a half bath, and they feature granite and cultured marble countertops, whirlpool baths, and floor-to-ceiling windows to view the turquoise Gulf waters. There are also large walk-in closets and ample storage in these homes. San Perdido real estate is located in beautiful Perdido Key, which is known for its quiet, slower-paced, laid-back lifestyle and pristine beaches. To the north of San Perdido lies gorgeous Ono Island and the intracoastal waterway. Perdido Key offers many family friendly attractions and exceptional recreation opportunities, from water sports and hiking at Big Lagoon State Park to day trips and picnicking at Johnson Beach. San Perdido offers the choosiest condo owner a wealth of luxury with a serene, residential atmosphere. Arrange a tour today! Please contact The Gatti Team at your convenience to inquire further about active property listings in San Perdido.